Geraldine marks the 40th anniversary of the Iranian revolution, talking to Trita Parsi, President of the National American Iranian Council and Dina Asfandian, Belfer Center, Kennedy School of Government. The encryption bill and all those amendments, why was it rushed through and why is the bill so globally controversial, with Sharon Bradford Franklin from New America and Suelette Dreyfus from the School of Computing and Information Studies, University of Melbourne. Prominent Holocaust historian Deborah Lipstadt discusses the rise in antisemitism across the West and her new book Antisemitism: here and now. What are the broader implications for the publishing world post the resignations from Melbourne University Press? With Sandy Grant, co-founder of Hardie Grant Publishing and Phillipa McGuiness of Newsouth Publishing. Sheep farmer Charles Massey on what we can learn from Middle East agricultural history. While much of the press is re-presenting the litany of scandals that emerged during Justice Hayne’s hearings (there’s plenty to go on), Ross Gittins considers the Commission’s findings from a broad policy perspective. “I think we’ll look back on this week and see it as the start of the era of re-regulation of the economy” he writes, going on to say “in so many cases, the 30-year experiment with deregulation, privatisation and outsourcing is now seen to have ended badly”. John Warhurst in Eureka Streetwrites that banks remain protected species. Customers cannot rely on governments to ensure that banks behave responsibly he warns. But are these naysayers too cynical about the government’s and the banks’ resolve? The lead story in The Betoota Advocate is “Banking Sector’s Image Repaired After ANZ CEO Spends Entire Day Pretending To Be Poor”. There is a huge contrast between the ostentatious vulgarity of the United Arab Emirates and the humility of Pope Francis. On the ABC’s Religion and Ethics Report, Andrew West interviews Joshua McElwee, Vatican correspondent for The National Catholic Reporter, who has been travelling with the Pope on his visit to Abu Dhabi. The Pope’s visit raises a number of important issues, including coercion in religion (particularly relevant for Saudi Arabia) and the prevalence of religious violence. Within the bounds of diplomacy, the Pope voiced strong and frank concern for the crisis in Yemen, subtly criticising those external parties fuelling the conflict. Particularly significant was the release of the Document on human fraternity for world peace and living together, prepared jointly by Pope Francis and Egypt’s Grand Iman of Al-Azhar, Sheikh Ahmed Al-Tayeb. The document may surprise those who hold stereotypical views of Islam and Christianity. The Catholic World Report provides a full text of the Pope’s press conference given on his return flight to Rome, in which the document is the main item of interest. The ABC’s Sophie McNeill has done an extraordinary job covering the story of Rahaf Mohammed, the young Saudi lady who spent a harrowing time barricaded in an airport hotel room in Bangkok while being hunted down by her family and by Saudi authorities. The ABC Four Cornersstory Escape from Saudi covers Rahaf’s flight while exposing the persecution of women under Saudi Arabia’s guardianship laws. McNeil and her colleagues Brigid Andersen and Georgina Piper have prepared a short web presentation The women who make it and the ones who don’t covering the story. There is disturbing evidence that under Peter Dutton’s direction Australian Border Force Officers at our airports are complicit in enforcing Saudi Arabia’s guardianship laws, turning back Saudi women who have valid visas but who are not accompanied by a male guardian. On the ABC’s Late Night Live, Phillip Adams interviews Leta Hong Fincher, author of Betraying Big Brother: The feminist awakening in China. Revolutionary China promoted gender equality, but the rhetoric in today’s China, where the government is concerned with the country’s falling birth rate and long-term demography, is about women marrying young and reproducing. She suggests that under Xi Jinping’s authority, the country is governed by a “hyper masculine personality cult”. In Foreign Affairs, Jill Lepore, Professor of American history at Harvard, takes up a similar theme in her article A new Americanism: Why a nation needs a national story, where she argues for a liberal, outward-oriented interpretation of patriotism. She traces the history of America’s view of itself going back to the Enlightenment values that guided earlier concepts of the national identity. Both Sullivan and Lepore admit that America has often strayed from those values, particularly in its foreign ventures, but they both argue for their re-assertion. After a rather ambiguous statement about the trajectory of future interest rates, on Friday the Reserve Bank released its quarterly Statement on Monetary Policy, which continues to have two bob each way on Australia’s economic fortunes, but overall it points to weakening economic conditions. Its forecasts for economic growth and unemployment are negative. Importantly for those carrying heavy debt, its forecasts for inflation are revised downwards, which means that the burden of debt re-payment (which can be eroded when nominal wages rise inline with inflation) will not be relieved. 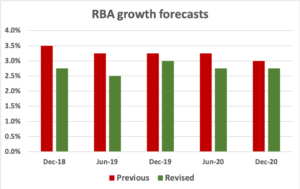 Contrasting with the Reserve Bank’s caution, Australian house owners expect house prices at least to keep their values or even to rise over the next twelve months, according to the ME Bank’s bi-annual Household Financial Comfort Report. Only 13 per cent of owner-occupiers and 11 per cent of investors expect house prices to fall. Myths perpetrated by property spruikers are hard to dispel. The report suggests however, that most households are becoming more financially cautious, confirming the Reserve Bank’s less than bullish forecast for retail sales.